​The advent of spring doesn't only mean the return of construction on Pennsylvania's roadways, but also the re-emergence of slow-moving farm equipment on many of the state's rural roads. Rural roads abound in Pennsylvania, offering motorists breathtaking scenery and sites steeped in rich history and tradition. In many areas across the state, it is not unusual to find yourself sharing the road with farm equipment and horse-drawn vehicles. While familiar fixtures on many roadways, these vehicles may also bring with them unfamiliar hazards. Additionally, many rural roads offer less room to maneuver, loose gravel or grassy berms, and an array of sharp dips and unexpected turns. When combined with the presence of slow-moving vehicles, these hazards offer motorists their share of driving challenges. 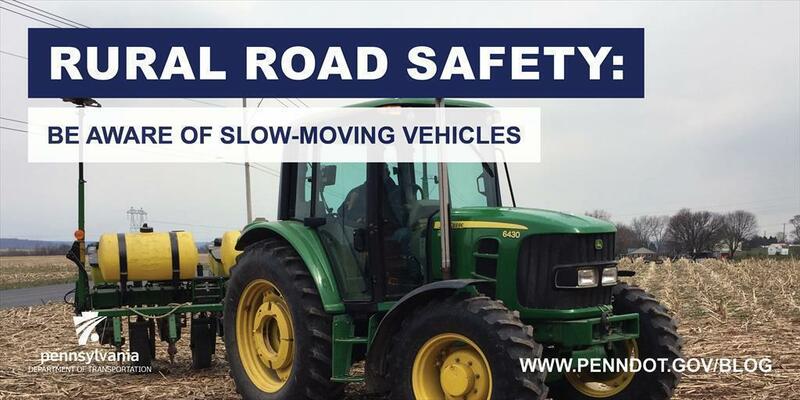 PennDOT recently acknowledged Rural Roads Safety Week (April 8-14) along with the Pennsylvania Farm Bureau, Pennsylvania Department of Agriculture, and the Pennsylvania State Police. However, while the Farm Bureau notes it's timely to remind motorists to be cautious now that spring planting is getting underway, practicing safe driving habits on rural roads is important all year long. According to PennDOT's 2017 crash data, there were 106 crashes, including 64 injuries and five fatalities, involving farm equipment on rural roads in Pennsylvania. In contrast, PennDOT data indicates there were 53,883 crashes on rural roads statewide last year, with 30,922 injuries and 693 fatalities from those crashes. You are within 100 feet of any intersection, railroad crossing, bridge, elevated structure, or tunnel. Do not assume that a vehicle operator who pulls the vehicle to the right side of the road is turning right or letting you pass. The operator may be swinging wide to execute a left-hand turn. Watch closure time while on rural roads. Closure time is the time a driver has to recognize and respond to a slow-moving vehicle. Farm vehicles usually travel less than 25 mph, while horse-drawn vehicles range in speeds between 5-8 mph. Be alert and prepared to stop.